Just a little over half way through NaNoWriMo now and as of first thing this morning I’m at 48,609 words. If I was doing a normal NaNo count I’d be finishing today. Since I’m aiming for 69,000 that leaves me with 20,381 words to go. Not too bad although I’ve been slower the last week or so. It’s definitely not a level of writing I find sustainable. I finished Mycroft 5 and have tentatively called it The Knight Who Started a War but I think that’s going to haev to change. As much as I like it it needs to be shorter I think. As is normal I’ve learnt some intersting things. Not least all the symptoms of hypothermia. But the most unexpected – It seems protégé is the maculine form and for a female student you would call them a protégée. Had no idea about that until two days ago. The hope is to finish Mycroft 6 by the end of this week or the beginning of next (I might actually take the weekend off). Then finish off a few other bits and pieces to get me towards the 69k I’m aiming for. Either way there’s still a fair amount to be written so I best get back to it. I know I’m only a few days into NaNoWriMo but here’s an update of where I’m at so far. Somehow in only two days I’ve managed to get about a third of the way into Mycroft 5. Still not a clue what the title is but I’ll probably figure that out soon. As often happens my character’s keep surprising me and even themselves. Amelia turned out to be claustraphobic and it turns out Mycroft and Sherlock can sort of work together, but there’s evidently some history there I don’t know about yet. Daniels, the chauffeur, is also even more awesome than even Mycroft realised, and I even discovered that Mycroft does have a sense of humour! Who knew! Research wise I plotted one heck of a route thanks to google maps. One of the most amazing tools as a quick way to be able to explain places. I honestly don’t know what I’d do if I didn’t have access to such a detailed map of pretty much everywhere in the world. Here’s a link for those interested. Yup Russia is involved. Over the next week I want to get this novella finished so I can take a day off to plot the next one, as I have no idea what happens except for a few series related scenes. It does sorta need its own plot as well. After that we’ll see. I’d like to be about this far into the next one in two weeks time, maybe a little further. It all depends exactly what trouble Amelia gets herself into between now and then! So it seems that I keep losing Tuesdays and always find myself thinking it’s Monday until far too late to blog. I think that says a fair bit about my mental state at the moment. I have now finished the second of two Mycroft Holmes Novellas. As I suspected the second wasn’t quite long enough to tip me over the edge of 60k mark I was aiming for but I’ve got a few other bits and pieces I can write this month to take me over for the monthly total although I won’t be using it as part of the validated word count on the official NaNoWriMo website. The last weekend I took off, however, and I definitely won’t be working too hard this week so we’ll see how high the monthly count actually gets. I’ll post it next week as it will probably be my highest monthly count ever. In terms of the Mycroft novellas I’m going to let them sit for a few weeks before I begin the process of second drafting them both, but that will probably be done quite easily in December and then handed off to my editor. For now I’ve got a bunch of other stuff I simply have to work on but I’m finding myself quite kean to delve into more in the Mycroft world so who knows what I’ll work on after this. More Mycroft isn’t technically on my schedule yet but I don’t like ignoring the inspiration if its tugging me in a specific direction wo the schedule could go out the window entirely. For now though, time to get back to the other stuff I neglected while writing the last three weeks. So I’m almost three weeks into the month and I’m almost there. I’ve written a total of 49,227 words so far this month, leaving me with only 10,773 to go to hit my target. Mycroft 2 netted me 32,252 and I’m at just under 17k for Mycroft 3 so if it’s as long as its prequels Mycroft 3 should take me over the 60k mark nicely, although that does seem to be where I might hit a snag. At my current place in the plot I’m only expecting Mycroft 3 to get to about 25k which would leave me 2-3k short of my target word count. Right now I’m not sure about the best way to solve that problem, but there’s a chance it won’t be. I’ve never been amazing at estimating word counts so I could be wrong. I definitely don’t intend to add filler to Mycroft 3 just to make the count although the plot is the simplist of the 3, probably why it’s coming up short, so I could try and think of a good twist to add somewhere. Alternatively I could settle for not hitting the 60k. I’d have finished the books so my task would be sort of done. My other option is to start something else or continue one of the other projects I’ve got on the go, which I think will be the most likely. Research wise, Mycroft 3 has been the easiest of the books. It’s mostly winding down on plot threads I’ve created in the previous two and focuses a little more on the relational side of things. Mycroft might even finally decide he likes Amelia. That’s all stuff I don’t need to research so other than looking a little more into a martial art I’ve been able to just keep writing. My aim is to try and finish Mycroft 3 this week. That leaves me with somewhere between 8-10k to write in 3 days so I’d best get back to it. It’s Tuesday again and still November so I’m still busy writing away. Well actually I’m not, but that’s because I’ve taken a day off. The second Mycroft Adventures novella is finished as of yesterday evening. I’ve written over thirty-two thousand words in just ten days. My aim for the month is still sixty thousand so I’ve got almost twenty-eight to go. The Mycroft novella really took on a life of its own and really wrote itself which was a pleasant feeling. It’s also given me plenty of ideas for sequels so I think there will be at least five or six of them. The next of which I will probably start writing tomorrow or the day after. Research wise I did quite a bit of random stuff for the second half of the novel as well, including looking into rare Russians coins from 1897 and more map searching in London for accurate times to different locations. Finally I wrote and borrowed a few more riddles. So far it’s been a very good NaNoWriMo and I’m hoping writing a third Mycroft story will make it even more awesome. Well so far I’m ahead of target (although I forgot that I was meant to blog this yesterday). As of right now I’m at 13288 words and a good way of the plot into my Mycroft novella. I’ve also updated the side widget to show where I’m at and you can probably see that I only plan to write about another 20k of this story. I haven’t decided what I’ll do after that so I’m expecting to need a couple of days right in the middle of November to decide what I’ll be doing to hit that 60k mark I’m aiming for. At this point in time I’m considering starting on the third Mycroft story but it is the haziest part of the plot in my head (the two stories after are very clear in an annoying sort of way). It would be the most satisfying way to spend the rest of NaNo though and probably the one most in keeping with the rules, but I could work on Victorious Ruin instead. I at least have that vaguely plotted out even if it’s a bit slow going on the writing front. And for the fans waiting eagerly for Victorious Ruin, no matter what I decide it will be what I finish once I’ve done NaNo. But back to how it’s gone so far. For the most part I’m actually sticking quite nicely to my plan and the plot notes I have to hand, although Mycroft is up to quite a bit more than I originally visioned. That’s probably a good thing because this story was going to be a bit weak on his side of things otherwise. International Crime stuff is very new for me so I’m quite literally making that bit up as I go along and hoping it won’t fall apart before I reach a satisfying conclusion of some kind. If I need to I can add in hints and clues that make Mycroft look clever during the second draft. In terms of surprise elements. I have riddles. Wonderful Mycroft riddles. I wasn’t expecting this at all and it was just a series of ideas that snuck themselves in and led that way so they’re there to stay. Probably the only surprise so far but a good one. I tried to do as much research as I could before I began but I’ve also had to pull up maps of London a lot and scout out areas. There’s a little hommage to one of the Sherlock writers, Moffat, in there for people to spot and I’ve had to look up quite a few things to do with stalkers and the sorts of things they write in letters. That was a little creepy. I also need to research a disease or condition someone elderly might have that requires constant supervision but I’m going to leave that for after NaNo, for now I just have (Disease) wherever it should be mentioned, which is only twice so far. With all that said I should probably get back to the writing, and probably watching V for Vendetta, because it’s the 5th and in Britain that means bonfire’s and fireworks and possibly a Guy called Fawkes. enjoy if you’re celebrating that this evening or at the weekend! So I’m doing this challenge again, just like I did both of the previous two years. I’m writing Sherdan’s Country, as you can see from the progress bars to the right. This is the third book in this series and has been very easy to write so far. I’m at 19k as of now and still going fairly strong. I’ve slowed a little, but I think it’s mostly because I’m writing a chapter I’ve not plotted at all at the moment. I only realised I needed it yesterday evening as I was going to bed. So far there’s been a few surprises for me, especially on Anya’s side of events. She’s acting on impulse a lot and it’s proving quite interesting to write. Sherdan is the one I’m most proud of. Since Sherdan’s Prophecy he’s grown a lot and I’m really enjoying writing from his point of view. As NaNoWriMo is going so well I’m seriously considering trying to write the entire book this month, not just the 60k I was aiming for, but I need another couple of 4k+ days to make me really confident about going for such a mammoth number of words in only one month and I’m slower today and not available to write this evening so we’ll see. I’ve also got quite a few events mid-month which will swallow some of my time as I get closer. Most notably the print launch of book 1 and 2 in the Sherdan series, Sherdan’s Prophecy and Sherdan’s Legacy. It’s a very Sherdan themed month. 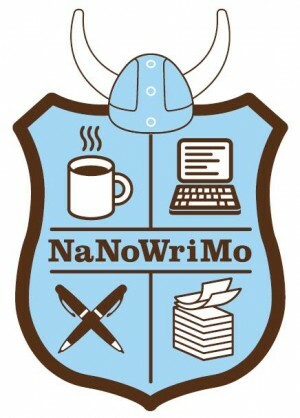 For those who want to keep track themselves you can find my NaNoWriMo stat page here. I update that several times a day with my progress. Yup, it’s almost that time of the year again. In just over two weeks I’m going to be trying to National Novel Writer’s Month (NaNoWriMo) challenge of 50k words of a new novel in one month. I’m actually going to aim for 60k as I’ve done 50k the last two years and want it to remain a challenge. As such i’m in preparation mode and I thought I’d share some of the things I do to try and get ready for such a momentous task. I’ve found that planning before hand helps to make the task a success. For the most part I try to avoid social obligations in November. There’s always a few, but I try to see peeps before or just after and this year I’m even taking a week off with my fella (this week in fact) to spend time with each other before I disappear down the writerly rabbit hole. Telling people you are trying not to do too much social during also helps because then they know what you’re doing and you can garner extra motivation from the fact they will ask you how you’re doing and they will know if you fail and have no good reason. I also make sure most of October is dedicated to doing anything that might get in the way, like other deadlines and other stories that are part finished. The last thing you need is someone nagging you to finish something else. Same goes for the chores. Try to get on top of the washing piles, the cleaning and anything else you don’t want to be distracted by when you’re writing (I’ve even heard that some people do their christmas shopping so they don’t leave it too late but I just do mine in December). Finally the day or two before I take off from everything but thinking over the plot for the books and writing plot notes on anything I think I really have to add. As my book will also be a sequel I’ll also read the rest of the books in the series to get myself immersed in the world and characters again and think over the first line. Sometimes it takes me ages to write that first line so if I’ve already spent hours thinking on it when I get up on the 1st I can just sit down and write the line I’ve already partially worked out.